← Thank you for reading! You are Beautiful! You know that beauty is not just about makeup and fashion. But how often do you think to yourself, “I’m beautiful.” Lots of girls and women think more negatively than we want to. The best news is that we can change that with the Inner Beauty Mirror Uncontest. Here is an easy way for you to celebrate what makes you beautiful -you will even be entered in a drawing for great prizes! To enter the uncontest all you need to do is create your own Inner Beauty Mirror. When we look in a regular mirror we just see our outward appearance –it isn’t anywhere near all of who we are as people. In this uncontest we challenge you to create a different mirror, the Inner Beauty Mirror. This mirror reminds you who you are and shows all the things you care about, all the things you are proud of, and all the things you do. This is an Uncontest because no one is going to be judged. There won’t be votes to choose a winner. We are all uniquely beautiful and we all win when we can see our own true beauty and enjoy it without comparing ourselves to someone else. All entries will be checked for completeness. Then the completed entries will be entered into a prize drawing. Names will be randomly chosen and prizes given. 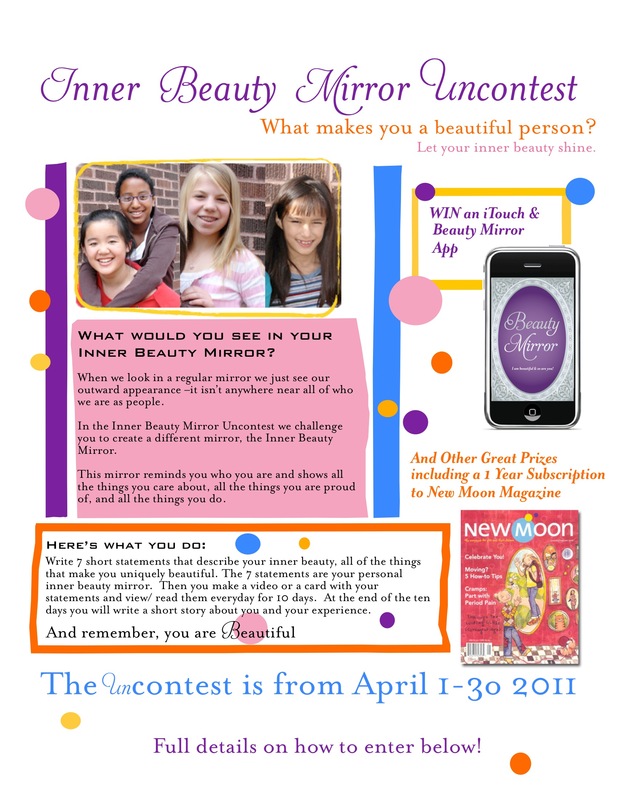 List of Prizes: iTouch with the Beauty Mirror For Girls Application, 1 year subscription to New Moon Girls, and more prizes to come! Who can participate? Girls of all ages. Write 7 short statements that describe your inner beauty, all of the things that make you uniquely beautiful. You can write about your characteristics, your accomplishments, things that make you happy, helpful things you do, how you believe in yourself and take care of yourself, your heritage, all the things that make you great. You want to write statements that light you up inside when you read them and they make you feel good about yourself. The 7 statements are your personal inner beauty mirror. Now you can create a short video of yourself reading the statements and watch it every day. Or you can make yourself a nice card or poster of your statements that you can read every day. The next step is to watch or read your Inner Beauty Mirror everyday for ten days; you may want to keep a personal journal to write in each day. At the end of the ten days you will write a short story about you the experience. Below are more details on the uncontest. 1. Create your 7 statements/ sentences. 2. Turn the statements into a 2-4 minute video, be creative and artistic! You can be in the video or not, you can use art, music, objects, etc. Just make sure to say or write out all of your 7 statements in the video. Safety reminder: the videos will be posted on NewMoonGirls.com so you can’t say your last name or any information about your school or where you live. If you do, the video isn’t able to be in the Uncontest. 3. Watch your video Every Day for ten days! 4. Then write a 250 to 500 word story about the Inner Beauty Mirror: what you did, what you learned, how it made you feel, what you liked, didn’t like, what was difficult, if you plan to watch the video in the future, if the Inner Beauty Mirror may help you not say judging things about yourself or others. 2. Make a card or poster with the 7 statements written out, you can decorate your card or poster however you like. You can use the Beauty Mirror iPhone App to create 7 beauty slides, and review them daily on your iPhone, iPad, or iTouch. 3. Read the card/ poster Every Day for ten days! The Inner Beauty Mirror Uncontest is the result of a collaboration by New Moon Girls and Beauty Mirror iPhone App. It is our goal to work together in supporting girls to see how beautiful and powerful they are.